Dental Health in Farmington: If My Gums Bleed, Should I Stop Flossing? 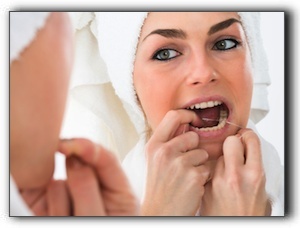 Home › Family Dentistry › Dental Health in Farmington: If My Gums Bleed, Should I Stop Flossing? This is a vital question occasionally asked by patients at Sundance Dental & Orthodontics. The answer, however, is “No!” Bleeding is probably a sign that you need to clean your teeth and gums more thoroughly—not leave them alone. It is extremely difficult to clean effectively between teeth without using floss or an interdental brush. If you have never flossed before, your gums might bleed the first few times you use floss. The bleeding may be due to dangerous gum inflammation. Keep flossing gently and the bleeding often stops within a week or two. Gum disease, and the more advanced periodontal disease, are extremely common in New Mexico and around the country. The Centers for Disease Control and Prevention (CDC) estimates that half of American adults aged 30 and over have periodontal disease. If you don’t make flossing a habit, and your gums become sore, swollen, and tender, it could affect your dental health in Farmington and cause gum disease. The good news is that, unlike dental cavities, gum disease can be reversed with improved oral hygiene. Some men and women find it easier to start on one end on the upper teeth and clean each gap one by one until they reach the end on the opposite side. Then repeat for the bottom row. Whatever operation you decide on, make sure you clean around every tooth, including the back surfaces of the last molars. What if you continue flossing for a few weeks and still observe bleeding? Call Sundance Dental & Orthodontics at 505-985-5626 to schedule a consultation regarding your dental health in Farmington. Michael Tornow, DDS, will carry out a thorough examination to determine the cause of the bleeding. At Sundance Dental & Orthodontics, our goal is to help patients keep healthy teeth and gums. Our team will not only carry out the most thorough dental cleaning, but they also educate patients on proper brushing and flossing. If you have a child who needs extra help learning how to brush and floss correctly, schedule an appointment with our Sundance Dental & Orthodontics team. Some patients have perfectly healthy teeth and gums but are not comfortable with their smile due to cosmetic issues. If you want to explore possibilities for improving dental health in Farmington, speak with us today at 505-985-5626. We offer state-of-the-art cosmetic dental services including teeth whitening, porcelain veneers, dental crowns, and tooth-colored filling replacement. Ask us about oral sedation options if you need help relaxing during dental treatment.